A symbiotic relationship between a fungus and an alga or cyanobacterium forms the lichen plant known as reindeer moss (Cladonia spp). The fungus forms the spongy padding on which the algae grows. An alga has the capability of making its own nutrients. It can absorb water and nutrients from the surrounding air which makes it intolerant of pollution. Reindeer moss fixes nitrogen into the soil whereever it grows, which benefits its surroundings. The moss also has the ability to break down rocks over time and form soil. Throughout history, reindeer moss has served many uses. In the far reaches of the Northern Hemisphere where food is often scarce, grazing animals consume reindeer moss. It is a common food for musk oxen, reindeer and caribou. In the winter months it is their primary food source. The bacteria and protozoans in the animal's rumen break down the reindeer moss and turn it into sugar. Special enzymes within the animal's stomach also aid in digestion. The indigenous people of the Arctic known as Dene eat reindeer lichen by killing the reindeer or caribou and harvesting its stomach after the animal has consumed reindeer moss. They remove the animal's stomach and make sure it is full of reindeer moss, then add the animal's blood. The mixture is allowed to ferment for a few days before they cook and eat it. Native Americans added reindeer moss in a powdered form to their soups and stews to thicken the mixture. Humans cannot digest lichens due to their acidic nature without boiling or cooking it first. Reindeer moss was used by early setters to kill wolves. They would stuff a dead chicken with the lichen so the wolf would consume the chicken and inadvertantly digest the reindeer moss. Once within the wolf's digestive tract the reindeer moss would be broken down and form usnic acid crystals, found in lichen. The crystals would cut up the wolf's digestive tract and kill the animal, according to the University of Wisconsin-La Crosse. Reindeer moss is a powerful indicator of environmental health and is widely used by scientists to study the surrounding world. The lichen does not do well if the surrounding area is polluted because it acts as a sponge and absorbs all the impurities from the atmosphere. In 1986, after the Chernobyl explosion in the Soviet Union, reindeer moss quickly absorbed the radioactive fallout of the reactor which showed how many miles the radiation traveled. 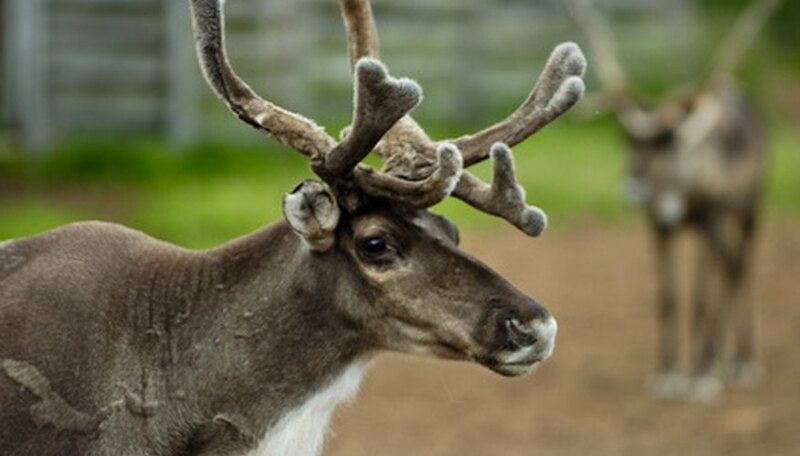 Unfortunately, the reindeer in the region continued to consume the lichen which caused radiation to build up in the meat and milk of the animals rendering them unsafe for human consumption. Thousands of the animals had to be destroyed. Reindeer moss has the unique ability of maintaining life even in dry conditions. During excessive rain it works as a sponge to absorb water but during times of drought it dries out but maintains life. Using reindeer moss in rock gardens and for xeriscaping landscaping has become a popular practice. The lichen offers a unique appearance to the rocks and surrounding area in the garden. Lichen also thrives with little or no care in extreme weather conditions. Reindeer moss is popular with model train builders who use it to decorate their track setups. The moss looks like tiny shrubs and trees when used in art projects. The acid from reindeer moss is used in the manufacture of litmus paper. Reindeer moss is widely used to make natural dyes for tweed cloth. The moss is also ground into a powder and marketed as an herbal tea.